The snow appears to be almost done. There was only supposed to be a couple inches, instead we got about 6 or 7! At least it is well below freezing so the snow is the light, fluffy kind. Sorry kids, the snowman is not going to stick together very well with this stuff. Makes it easier to shovel though! Poor Bookman has a twitchy back and the shoveling he did to clear a path to the chicken coop this morning is now threatening to send him into a spasm. He is moving ever so carefully. I am so glad I don’t have back problems. Plus I also like to shovel snow. Which is good because after I shoveled the front walk, I finished clearing off the deck, got the snow off the chicken coop roof, and cleared the snow from around all the bins. 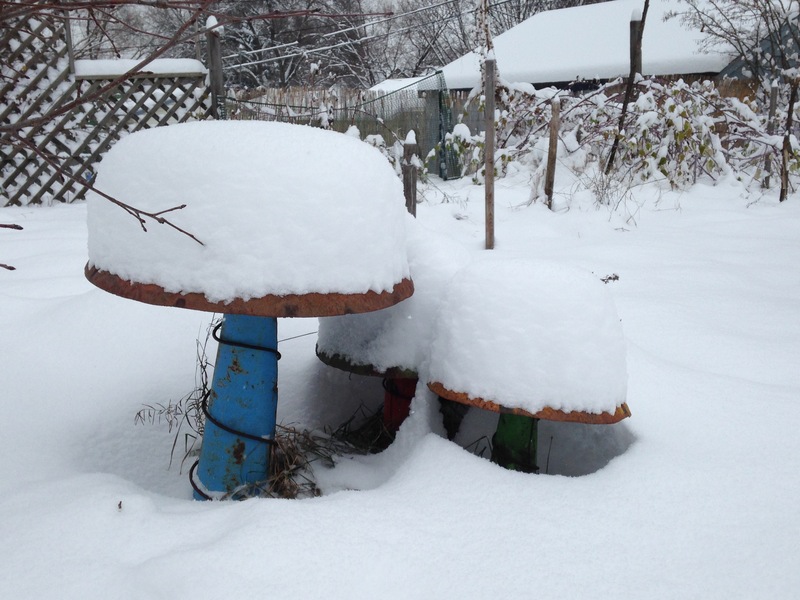 Unlike the other two snowfalls we have had so far this winter, this one is not going to melt until spring. A polar vortex is sweeping in this week. We’ve already had a little taste. It was 4F/-15.5C yesterday morning. The snow overnight actually warmed things up a bit and we are currently a toasty 20F/-6.6C. Because the days are so short, I don’t get to see the Dashwoods during the week. They don’t wake up until long after I leave for work and they have tucked themselves in for the night by the time I get home. I shine a flashlight into the coop to make sure they are all there before closing the coop door for the night. Their run is shrouded in opaque plastic to keep the wind and snow out and it works really well. It also keeps the run noticeably warmer than the outside air temperature. We have also put straw down on the ground inside the run so they don’t have to walk on cold dirt. They weren’t too sure about it at first but quickly got over it. what are the Dashwoods doing in there? Last night we turned on the heat lamp in the coop for a little while to warm it up for them a bit. I took a picture with my phone after dark so you could see the lights. 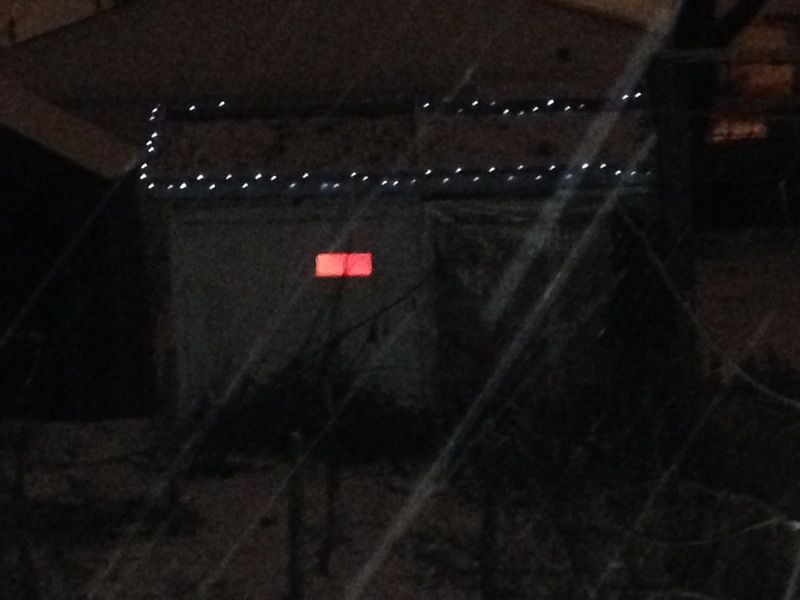 The coop windows were glowing red — looks rather horror movie! And the snow was already falling. So the picture is not very good but good enough so you can get an idea of the coop shenanigans. I went out Saturday afternoon to visit the Dashwoods, worried since they haven’t seen me all week that they might have forgotten me. Ha! I had lettuce and broccoli sprouts and the rest did not matter. After the treat was gone I stayed and talked with them a bit and they had plenty to say. Marianne jumped up on my back but because I am now wearing my winter coat, which is slippery, instead of fleece, which is very grabbable, Marianne jumped up and as soon as she tried to move she had nothing to hold on to and slid right off. The dismount involved lots of squawking and frantic wing flapping and a hard landing on the ladder to the coop. I got a scolding before she huffed and fluffed her way into the coop to right her appearance before coming back out to scold me some more. When I was out shoveling snow off the coop I also freshened the bedding and checked for eggs. I thought they would stop laying but they haven’t, they just don’t lay every day. They wanted to come outside so badly but I wouldn’t let them. They let me know they were not happy about this, all of them clucking and squawking and complaining as I worked. Maybe I should clip out magazine photos of sunny beaches and sparkling lakes and put them up in the coop and around the run, give them something to look at and dream about. Do chickens dream? Can they see 2-D images? Knowing the Dashwoods, they would be more likely to eat the paper instead of look at it. I’ve gotten both of the garden catalogs I order most of my seeds from each year already and I have paged through them like a thirsty person at a desert oasis. Earlier in the week I learned that sunflowers, something we already like growing around the edges of the garden here and there, are good for the soil because they have deep roots and bring nutrients up top making them accessible to the shorter roots of other plants. So in the spring instead of planting a few here and there, I am going to have a patch of the veg garden planted in sunflowers. I’m going to get a few shorter varieties instead of the giant ones we usually grow. I bet I can plant pole beans with them too if I space them apart a bit. Going to try it! I also learned this week that the pea gravel we started covering a garden path with is bad. The gravel itself isn’t bad, the bad is where the gravel comes from. For some reason I thought, gravel, 100% natural and it is just shoveled up off the bottom of dried out lake beds or something. Um, nope. Gravel is mined. The nice small round pebbles were created over thousands of years by glaciers and rivers and lakes and deposited in alluvial plans. The gravel is usually buried underneath dirt and trees and meadows. To get it, the trees are cut down, the dirt removed, and an open pit mine dug. I was horrified. I had no idea. Crushed rock or limestone, even sand, is no better. All are quarried or mined, destroying the landscape and harming the environment in the process. When I told Bookman about this we both immediately decided that from now on we will only use wood chips and those wood chips would be obtained from local sources — the city and tree trimming companies. I am really glad we never got much of the path covered, only right by the gate and one or two steps in. And while I like the crunch it makes underfoot, I have noticed the Dashwoods don’t care much for it. They scramble across it to the rest of the path that is still wood chips. Well and so. Always something new to learn! I had no idea about the gravel either. It seems to be very difficult to do anything without damaging the environment. Piningforthewest, I know! Made me wonder what other horrible garden related things I don’t know about. Sigh. Our cats, normally inside/outside cats, are feeling cooped up (ha!) just like your chickens. They CAN go out, but when the weather is snowy they don’t like to get their paws cold and wet. I can understand how the Dashwoods feel all cooped up. Sorry..please excuse the pun! But I had no idea about gravel. Something to learn and remember! cirtnecce, no apologies needed, I have caught myself saying cooped up a number of times! I was sad to learn about how destructive gravel is but glad to learn it before I had covered all my garden paths in it! Oh dear we have a lot of gravel which I thought came from natural sources also. BookerTalk, I know! I thought how much more natural can you get than gravel? It’s destructiveness is a well kept secret! We only got a dusting down here on Long Island. As long as I do not need to travel in it, I am looking forward to snow. I had no idea about gravel. That is horrible. I have purchased it in the past. I will no longer do so. Brian Joseph, yeah I love the snow too as long as I don’t have to go anywhere. If I have to go to work in it, not so fun even when the bus and train folks are doing all the work! I am kind of relieved I am not the only one who didn’t know about gravel and also glad I can spread the word. It is feeling like spring here! What a contrast to see the snow. I’m still getting seeds from my milkweed plants–which should be long gone by now, but keep up the effort. I can picture the Dashwoods huddled on their perches in the orange glow of the heat lamp. Maybe they’re telling each other stories about this strange stuff you call snow. They’re very lucky to have such snug and posh quarters. I laughed when you described Marianne scolding you for wearing a slippery coat. How unaccommodating of you! I hope you learned your lesson! I had no idea about gravel either. How totally sad and I am with you on being horrified at the thought of using it. I wonder sometimes about a lot of things I bring into my house and fear what awful things are happening so I can have something nice or pretty or convenient. Should I feel bad for the Dashwoods being outside? But it does sound as though they are nicely tucked away back there. Maybe they need some mood music? You know they probably are partying out there when you’re not looking! 😉 We are getting the same arctic air (brisk is a serious understatement to describe my walk to the bus this AM). Luckily no snow yet (nothing, that is, that has stuck). Danielle, it’s hard when you want to do the right thing by the environment but are foiled through lack of knowledge or lack of accessibility. Do not feel bad for the Dashwoods. They are snug as bugs. Ok, so it isn’t as warm as my house but they are pretty hardy and it is warm enough in the run that I can take my gloves off and not be painfully cold. Ha! They are probably partying out there and I don’t even know it because I can’t see them through the plastic sheeting! Re the gravel, isn’t it amazing the things we assume are natural (or whatever) but discover aren’t. Ethical living is a huge challenge and I’m afraid I don’t live up to it very well! BTW Are the Dashwoods roosting yet or just cooping!! whisperinggums, ethical living is a challenge especially since information about how things are obtained or made is not always readily available. And even if it is, sometimes there just isn’t a viable alternative which leaves us between a rock and a hard place. The Dashwoods still aren’t roosting! Though I think the urge is there since it is so cold they want to sit off the ground/floor but instead of saying, hey look at the roosting bar, we should go up there! They try to sit on the edge of the ladder just inside the coop door and then get mad when I push them off at night to close the door. Silly birds. Perhaps you have to teach them to look up! We learnt quilt in mislabelled cities that they are very vertical place, because land is rare and so they are many places like cafes, bookshops, not at ground level… You have to get used to looking up.